You never hope to see what happens when school bus meets snowplow, but it happened on the roads of Savannah, in upstate New York. A bus from the Clyde-Savannah Central School District was coming up over the hill when it was met head on by a snowplow coming in the other direction. In case you can’t tell from the image above, the bus lost that collision. 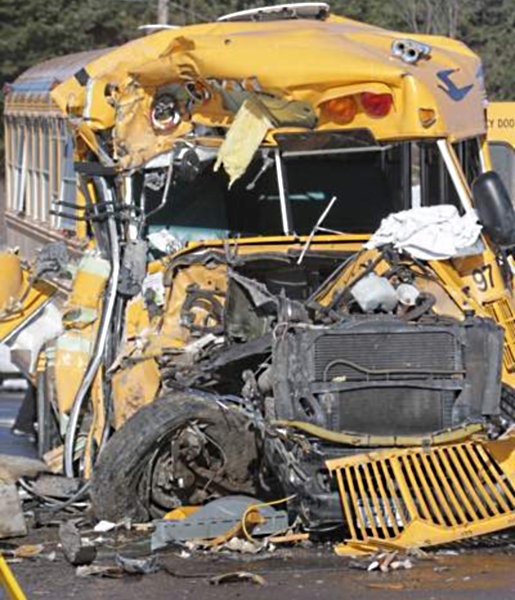 A school bus full of fifth and sixth-graders collided with a snowplow. Of the 37 students on the bus, 22 were injured (along with the bus driver). The driver of the bus, 48-year-old Ruth Y. David, was trapped for over an hour until rescue crews were able to pry her out of the wreckage. Two students sitting in the front seat on the right side of the bus suffered serious injuries and were trapped for 30 minutes. It’s a pretty incredible car wreck, and no doubt all involved are thankful no one was killed.